Thanks to information from a MA Tramway report provided by Kevin Thomas, NELSAP first heard of this area. James Hallock then contacted us with more information and photos from his yearbook, which appear below. 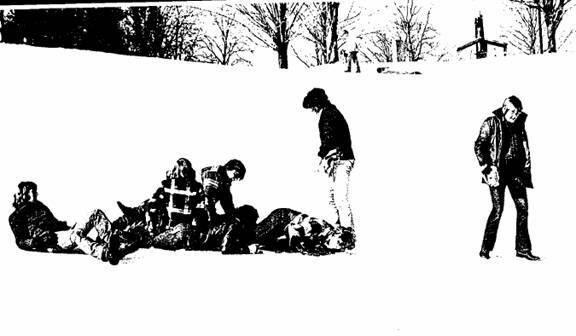 The rope tow operated on campus on Chapel Hill, and had 80-100' of vertical. It may have operated sporadically in the early-mid 1970's. Mt. Hermon also had a jumping hill that is no longer in use. The following pictures appeared in the Northfield Mt. Hermon yearbook. The tow was located on the Mt Hermon campus on the hill leading to the chapel from Overtoun Hall. 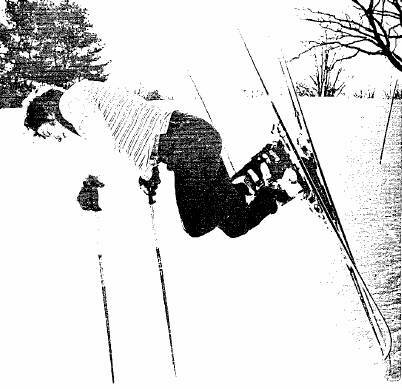 The tow was used by the JV ski team and for a PE class. The tow is no longer standing. The school may have better photos in the archives. In the lower photo, note the wheel house at the top of the hill. The tow is typically of rope tows of the era as the return was assembled from old tire rims attached to telephone poles. A telephone pole is visible in the upper photo. Mt. Hermon rope tow - 1975 Upon my inquiry to the school, the response indicated that the Mt. Hermon tow may have been the same tow that was formerly located at the Northfield Inn. The school also owned the Inn. More than likely, the tow at the Inn would have been on the golf course. The golf course is still in use, although the Inn has been demolished. I have seen several postcards of guests enjoying skiing and tobogganing at the Inn, but none of the post cards pictured a tow. There was a toboggan chute at the Inn, of which I have seen photos. The photo to the right is from the 1977 Mt. Hermon yearbook. We had a lot of fun on the rope tow hill performing tricks as the “pole roll” indicates. A jump was usually constructed underneath below the chapel. Ed Pitoniak: One was on campus and consisted of a rope tow that ran up Chapel Hill. I think it may have last run in the winter of 1971. It might've been all of 80 to 100 vertical feet and allowed students to slide down what was a glorified lawn. Stuart Elliot: The smaller recreational area, known as Chapel Hill, ran from the school’s chapel toward Overtoun Hall on the southeast corner of the campus. 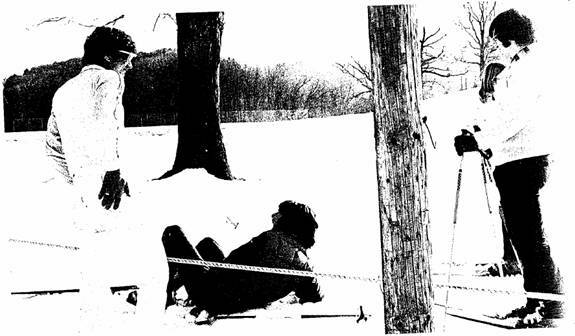 A short rope tow of several hundred feet operated on this hill from approximately 1965 to 1978 when it was relocated to a private hill off East Mineral Road in Millers Falls by its builder, a former school employee. Chapel Hill also hosted a small eight-meter wooden-trestle training jump.